I don't know how many posts I did last summer on rainbow stripes but it certainly was a lot! This fall, as the temperature cools down, rainbow stripes are definitely still as hot as ever. 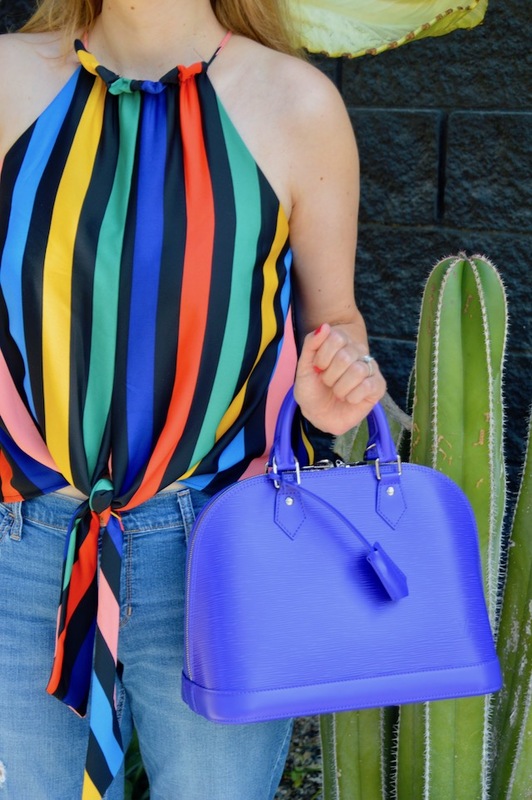 Take, for example, this halter top from Red Dress Boutique in a print they call "rainbow feels". Anything called "rainbow feels" has my name written all over it! Due to the fact that the top is sleeveless, it definitely would work for spring or summer but the black background of the print also makes it a bit more "fallish" in comparison to some of my other rainbow stripe items. I decided that this top would work best with jeans and I realized that I haven't worn jeans in a while. During summer, I tend to wear more skirts and shorts because I find them to be cooler than jeans. I do, however, love these boyfriend style jeans because they are quite soft and so incredibly comfortable. I thought wearing them would be a good way to offset this fun and feminine top. Certainly, this outfit would be perfect to wear out on a fun Saturday night or, if you're boring like me and you seldom go out at night, you could just wear it for a casual lunch out during the day, which is exactly what I did last weekend. Without a doubt, as my title suggests, there's no wrong time of the year or the day for rainbow stripes! Beautiful and full of energy stripes! Very nice outfit! This top is gorgeous! Love this vibrant look!